Is there any potential for waste recycling in Georgia? Paper is a renewable resource. However, it is crucial to use it wisely. According to a study conducted by Xerox Corporation, one of the world’s largest suppliers of printing paper, office workers throw away 45 percent of documents within 24 hours of printing them. 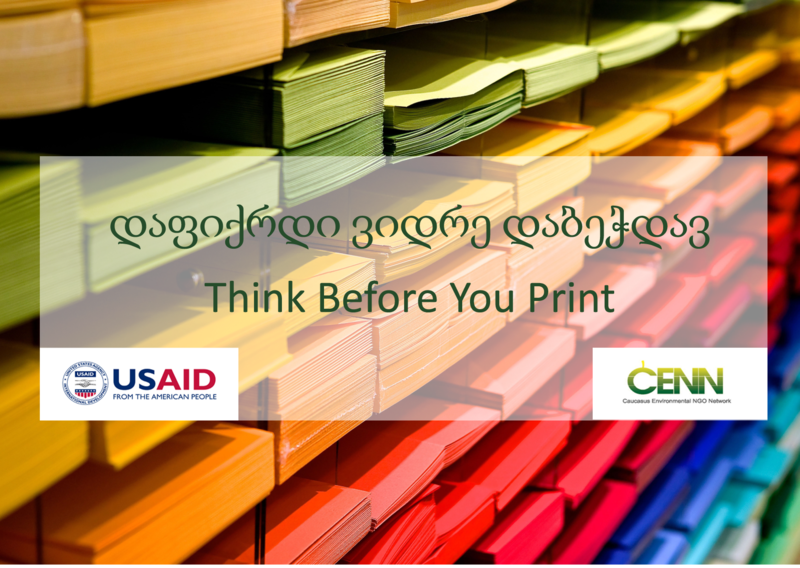 This article suggests some tips for the sustainable consumption of printing paper. You do not have to stop printing entirely, but you can preview your document beforehand and print only the portion you need, not every page. Try to use an electronic version of documents instead of hard copies. Anytime you have to print or make photocopies, always try to use the double-sided printing feature. Furthermore, you can print two reduced-size pages on one sheet of paper. The combination of these two approaches is the best way to reduce paper waste. Another great way to conserve paper is by using all of the available space on a sheet of paper. By simply reducing your margins from 1 inch to 0.5 inches, it can cut several pages off a large document. According to a report by Penn State University, the university could save 291,373 square kilometers of forest and more than $120,000 a year just by reducing margin settings campus-wide. Lastly, paper’s final resting place is the recycling bin. It does not reduce the amount of paper you personally use, but it does reduce the number of trees that are cut down as the paper you supply to recycling companies are turned into other paper products. Therefore, when we are talking about the sustainability of printing paper consumption, we should remember that not only amount, but the type of the paper is an important aspect we should pay attention to. There are many options on the market for printing paper. Consumers can choose virgin paper or different percentages of recycled content paper. 100% post-consumer recycled paper is totally re-processed from paper scraps that can no longer be used for its intended purpose by the consumer. Recycled paper with lower percentages of used paper as a raw material also exists. Typically, the higher the proportion of used paper in the production of recycled paper, the darker the final product. However, with advances in technology and recycled paper processes, recycled paper can now be as white as non-recycled paper and have the same printing performance. Nevertheless, these technologies are still quite expensive to utilize and the price of the final product reflects that. Developed countries such as Switzerland, Sweden, Austria, Netherlands, Germany, and the U.S. are the leading paper recycling countries. They promote the use of recycled products, because recycling allows them to use existing resources efficiently and produce necessary products from waste with minimal costs. However, the most important factor is that recycled paper typically has a lower environmental impact than virgin paper during its lifetime. – Recycled paper is made without causing deforestation, while the production of virgin paper requires logging that could lead to erosion and, in the case of extensive logging, habitat loss and animal extinction. – Paper recycling reduces solid waste. If used paper is not recycled, it goes directly to the landfill, which contributes the largest source of methane emissions in the atmosphere. Decomposition of paper, in particular, is considered to be among the most significant causes of landfill methane emissions, a major contributor to global warming. – Production of recycled content paper usually requires less energy, whereas the production of virgin paper creates higher carbon emissions in the typical manufacturing process. – Virgin pulp and paper factories are among the largest industrial consumers of water per product-ton, whereas recycled paper products can cut the waste of water by more than half. 1. Be the equivalent of taking 248,000 cars off of the road for an entire year. 2. Result in energy savings that could power 216,000 homes for an entire year. 3. Save enough water to fill over 15,000 swimming pools. Thus, when it comes to printing paper consumption, recycled paper is the greenest option. However, the importance of virgin paper should not be underestimated. While used paper can be recycled four or five times at most, without the production of virgin paper, the world would run out of paper within just a few months. Paper made from virgin fibers can be environmentally-friendly as well, but as long as we choose wisely. As forests play a critical role in sustaining life on earth, we have to create a demand for products that originate from responsibly-managed sources, i.e., paper made from farmed trees or fiber that has been certified by the Forest Stewardship Council. Ultimately, recycled and certified virgin printing paper consumption is the most sustainable option and guarantees that each sheet of paper used every day has a minimal impact on the environment. – Five Paper Tips from Xerox Corporation: Use Less, Use Wisely, Office Product News, 2008. – Reduce Printer and Paper Use, UC Davis. – Benefits of recycled content paper, the City of Portland Oregon, 2014-2015. – Recycled vs. Certified Virgin Paper, Domtar, 2016.